Reading the Fantastic Four comics from the start. Issue #386 is part 11 of the 12-part Starblast crossover, a forgotten Namor/Quasar event series. As we’ll soon learn, you don’t need to read the rest of Starblast to get caught up. Following the events of Namor #48, the FF’s ship, the Stealth Hawk, is buried after an undersea earthquake (a “seaquake” as it’s called in this issue), with Sue, Ben, Namor, Tiger Shark, Stingray, and an alien named Tamara on board. Namor and Tiger Shark swim outside to give the ship a push (no, really) which frees everyone from being buried in rubble. Tamara reminds of the crossover’s overall plot, in which an aquatic alien named Xylym the Formaluauti is using high-tech thrusters to flood the entire Earth, making it a new home for his water-based people. Cut to a hospital in midtown Manhattan, where Lyja is about to give birth. 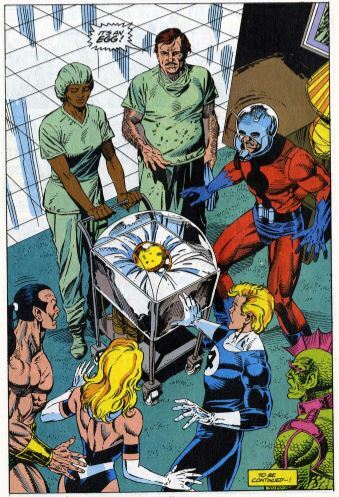 There’s a lot of cringe-y talk about Skrull birthing procedures, and the Earth doctors having to learn to use a Skrull “birthing device.” After that, Johnny is doing the expectant-father-pacing-nervously-in-the-waiting-room shtick seen in so many old sitcoms. On board the Stealth Hawk, Namor appears to be putting the moves on Sue, until she tells him she believes Reed is not dead, but still alive somehow. Namor backpedals, and says he was merely offering his assistance in her quest to find Reed. In space, we meet Xylym the Formaluauti, who is a one-eyed blob monster. He says flooding the Earth was really a distraction, to prevent the Earth superheroes from learning his real plan. He instructs his henchmen, the space pirates called the Starblasters, to create a giant tidal wave. The Stealth Hawk comes across Xylym the Formaluauti’s ship rising from the ocean, revealing he was on Earth all this time and not in space. Sue immediately fires missiles onto the other ship, with the others on board criticizing her for acting so rashly. At the hospital, Lyja explains to the doctors again that she’s an alien shape-shifter. 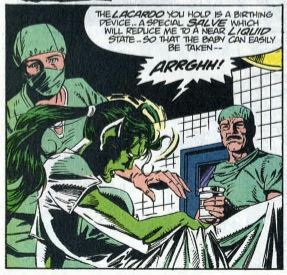 She further explains that the Lacaroo medicine the FF brought back from the Skrull throneworld a few issues back will temporarily transform Lyja into a liquid so that the baby can “easily be born.” From there, we get a short scene in Latveria, where Dr. Doom makes a public appearance after having been missing for several weeks. We then learn that this is merely time-traveling Nathanial Richards impersonating Doom. He hopes to locate Franklin, insisting that only Franklin can stop an upcoming cataclysm. Out in the ocean, the battle is already over, and the Stealth Hawk has Xylym the Formaluauti’s nearly destroyed ship in a tractor beam. Sue, Namor, Stingray and Tamara board the ship, with Ben and Tiger Shark staying behind to maintain the tractor beam. Namor captures Xylym the Formaluauti and brings him back to the Stealth Hawk. Rather than negotiate, Tamara goes ahead and murders Xylym the Formaluauti right there in front of everyone. This has an immediate effect on Sue, as Tamara’s brutality reminds her of the anger and fury she experienced when possessed by Malice. Namor sees this and again puts the moves on Sue, saying she doesn’t need to face the darkness alone. Ben eavesdrops on them, suddenly jealous because he’s a monster, and not as handsome as Namor. At the hospital, there are (of course) complications with Lyja’s pregnancy. It’s more uncomfortable alien weirdness as Lyja’s body is reduced to a “spongy state” and a glowing gold implant is removed from her body. Sue and Namor arrive at the hospital just in time for the big reveal. Lyja has not birthed a baby. Instead, she has… laid an egg!!! Fade out: Even though Sue is supposedly free of Malice’s dark influence, part of it is apparently still with her, as she opens fire on the enemy ship, ending the battle before it begins. Clobberin’ time: Ben is no longer wearing that metal helmet to protect the sensitive scars on his face, but they are still sensitive. In this issue, the scars are covered with bandages after he got banged up in Namor #48. Flame on: In addition to worrying about Lyja and the baby, Johnny also takes time to worry about Franklin and Dr. Doom. Basically, he spends the whole issue worrying. Fantastic fifth wheel: While at the hospital, Ant-Man calls his daughter Cassie to check in on her. We learn he has told her he’s the FF’s newest member, and that she’s thrilled about this. Four and a half: There are three panels in this issue devoted to now-teenage Franklin, possessed by the psychic Malice entity. All we see are him hiding in a back alley in the city, with an evil smile on his face. The Alicia problem: Lyja explains to the doctors that Skrulls shape-change via “muscular expansion and contraction.” According to The Official Handbook of the Marvel Universe: Deluxe Edition, only some Skrulls use their muscles to shape-change, while other Skrulls have their entire bodies made of unstable molecules, to allow for even greater shape-changing. Trivia time: The tiny amount of people online still talking about Starblast seem to agree that the Namor half of this Namor/Quasar crossover had nothing to do with anything, and seeing as how it unceremoniously wraps up in this FF tie-in issue, I’m inclined to agree. The real action took place in space, where Quasar led a ton of D-list Marvel to battle a cosmic villain named Skeletron. Quasar’s team included the Shi’ar Imperial Guard, the Soviet Super-Soldiers, and, in a surprise twist, all of Marvel’s ill-fated New Universe characters. 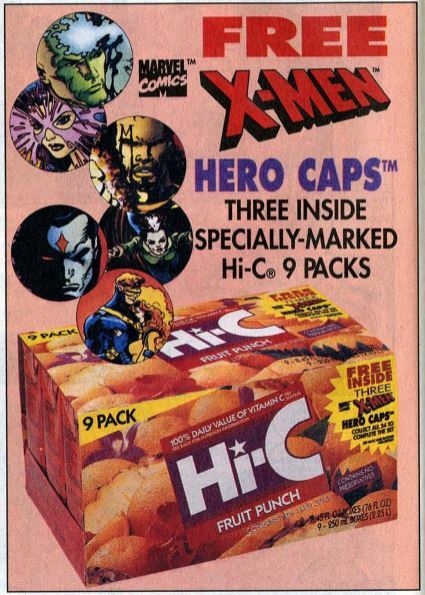 The series ended with everybody from the New Universe being brought into the Marvel Universe proper. Fantastic or frightful? Shrug. All the Tamara vs. Xylym drama is only meaningful to those were following the Namor series at the time. That leaves the Lyja plot, which is just gross and weird. Next: Meet the new boss, same as the old boss.